The MightyLite Leading Edge Self-Retracting Lifeline is designed to protect a worker during a fall that involves going over an edge. 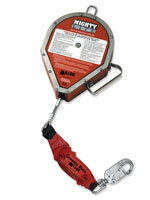 The MightyLite LE SRL features a shock absorber integrated into the lifeline, lowering fall arrest forces. It has durable, corrosion-resistant stainless steel and aluminum; is 30-percent lighter than competitive models; and has a dual-swivel design to minimize lifeline twisting during use.